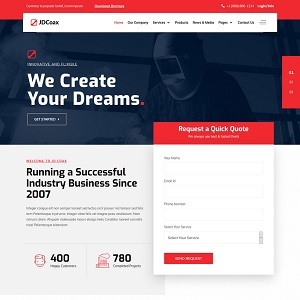 JD Coax is a highly Responsive Joomla Template which comes with catalog shop integration which enables you to showcase your product catalog easily. JD Coax helps you to organize all of your content with Article types such as Regular, Video, Gallery, Review, and Quote. JD Coax comes with multiple header variations that can be changed directly from backend admin panel. Doesn’t matter which language you are using to write your blog JD Coax Joomla 3.9+ template supports all languages including RTL. Make your post automatically capture the featured image, article title, and description when the article is shared on social media. JD Coax is very well cleanly coded which makes it faster to load. So you don't need to worry about the speed of your Joomla website. JD Coax is fully E-commerce ready. You can develop a catalog shop, a full fledge online shop or a marketplace by just switching a few options.